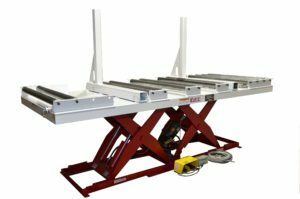 Scissor Lift | Plain - Roller Deck | Black Bros.
Scissors lifts – either plain or with roller deck – are required for each lay-up station.Incorporating a gravity roll conveyor on the lift deck provides easier stack movement. This arrangement is equipped with a brake to keep the rolls from turning, enabling a stack of doors to be assembled on a caul board placed on the conveyor. A foot control allows the operator to lower the lift as the stack is being assembled, then raise the load to place it on the transfer cart. The entire arrangement is recessed into a floor pit to maintain a convenient working height for the operators.